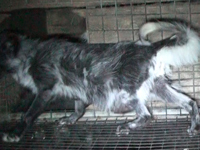 Excessive confinement and selective breeding on fur farms cause animals physical health problems. To create bigger pelts foxes have been selectively bred and fed high fat diets, causing their size to almost double in the last 20-30 years. Leg weakness, strain on joints and early abnormal bone growth are also common. This increase in size causes obesity, leading to difficulty in moving and diarrhoea . During the period of observation, we found breeding foxes were generally in poor physical condition, having experienced one or more breeding cycles. For example one mother was very thin with a saggy belly; the noticeably flimsy flooring of her cage made it difficult for her to walk. A life stood on a floor of wire mesh results in foot problems for many of the foxes; deformed feet and overgrown claws. Instead of the normal bearing of the foot, standing on the tips of their toes, the weight was carried on the whole foot. The size of the holes in the mesh may cause the animals to walk in this atypical way, to make moving around the cage more comfortable. A study of caged foxes found that bending of the front feet occurs more often on a mesh floor than on earth and smaller cages cause more animals to have bent feet. A study of caged foxes found that bending of the front feet occurs more often on a mesh floor than on earth and smaller cages cause more animals to have bent feet. 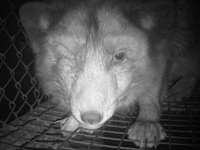 One fox was filmed on multiple occasions with a bad eye, weeping and swollen with pus, its condition deteriorating until it appeared the fox could no longer open the eye, indicating the eye had not been treated.